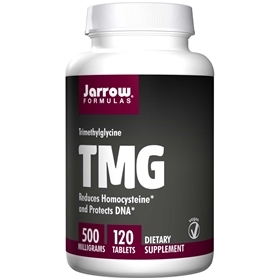 TMG 500 provides trimethylglycine, an important methyl donor (a.k.a., anhydrous betaine). Methyl donors, such as TMG and folic acid, are required for converting homocysteine (a toxic amino acid and a serious health risk) back into methionine and for the accurate synthesis of DNA and RNA, which is essential for the production of normal cells. Take 1 tablet 1 or 2 times per day with a meal or as directed by your qualified health care consultant. Store in a cool, dry place. Easy-Solv® tablets are designed to disintegrate within several minutes of ingestion. Dicalcium phosphate, cellulose, stearic acid (vegetable source) and magnesium stearate (vegetable source).